The View From Argyle Heights: I Walk Alone...Or Do I? October 25, 2009... I had been working odd hours for weeks, taking trains home at 3am, 5am and the like. Sometimes the Q but usually the F because it seemed to run more frequently then, although it was a longer walk home. The front exit of the F train stop at 18th Ave is at Parkville and McDonald Avenues, a mere half block to Foster. Since McDonald is the equivalent of East 0 Street, walking to Argyle Road, the equivalent of East 13th Street, is almost a mile when you count in the other north-south blocks. However, there are 16 stops from the West 4th Street station in Manhattan to 18th Avenue on the F, vs. 8 stops on the B to Newkirk. Bummer. Especially when there's some crazy dude in your car screaming about the gypsies eating his hair. Tuning the crazy guy out, I remember when there used to be a freight train that ran along the trolly tracks on McDonald Avenue, underneath the El, until the 1970's. Prior to the El being built around 1920, the grade level service was called the "Culver line". 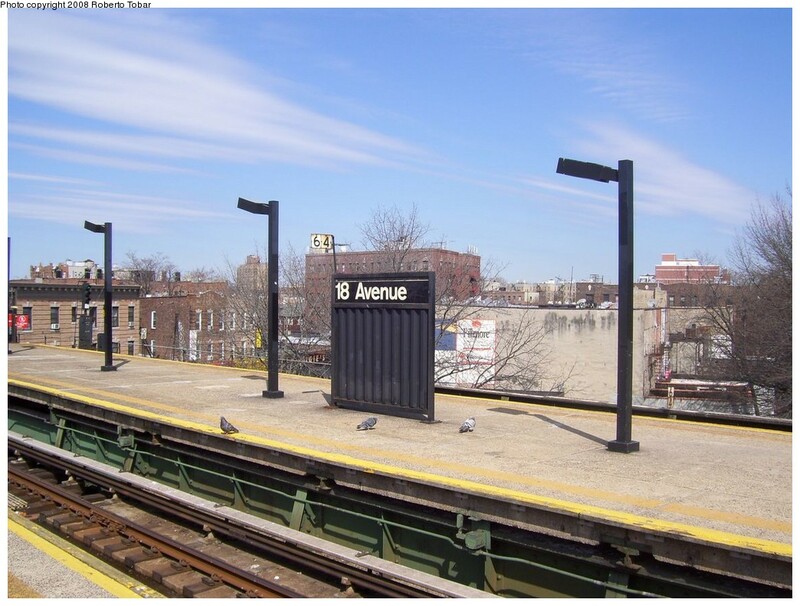 Since I still see signs for the "Culver Local" on F trains, I looked this up and Andrew R. Culver laid track back in the 1870's that ran from Prospect Park West (then called 9th Avenue) and 20th Street, intersecting McDonald at Ditmas Avenue, where it hung a right down to Coney Island. And now nobody knows who Culver was but his name lives on. Well played, Mr. Culver, well played. And there you have it, subway fans. Anyway, as I was walking along Foster Avenue last night, past the Abu Bakr Mosque where the Blind Sheikh was arrested back in early July 1993 (after plotting to blow up the United Nations, and a few bridges and tunnels), it started to rain. The Abu Bakr is directly across the street from Engine 250, which lost firefighter Michael Ragusa on 9/11, when the Blind Sheikh's associate, UBL, blew up the World Trade Center with human missiles. It occurred to me that it had been 8 years since 9/11, and 8 years had also passed between the first and second World Trade Center attacks. Back in 1993 my wife had been inside the World Trade Center and in 2001 she and my brother and others I knew had been seriously affected by the next attack. All had survived. Not so the sons of firefighters I had worked with two decades earlier. Everyone remembers where they were on 9/11, but I tried to recall where I was in 1993 when the press swarmed around the tiny Abu Bakr mosque, where the Sheikh had holed up, trying to avoid the life in prison that awaited him. My son was only 18 months old then. We must have been home, maybe getting ready for family to visit for a 4th of July bar-b-que. I think my next door neighbors, the Rhines, had just moved in. Arthur was a Mets fan. A fellow-sufferer, sweet! The rain came down harder on Foster Avenue. When it rains, of course, I can hear them rejoicing at Dawn Dry Cleaners, as the crease disappears on my pants yet again. Oh the joy of being the only person wearing a suit and tie, disembarking from the NYC transit system at 4:30am. Talk about standing out in a crowd. As I walked along, nearing Seton Place, not far from the 70 Precinct house, where many more memories swirled, my BlackBerry rang -- it was my boss who said I should turn around and come back to the job. As I attempted to talk my boss out of such foolishness, a blind man, tapping the sidewalk with his cane, walking West on Foster (as I walked East toward Argyle Heights) called out to me as he came abreast. "Please help me!" he implored. One thing about being on the street at 4:30am in the rain. When somebody yells in your direction, three feet away, to help, there's no way you can ignore it and keep walking, by rationalizing "Oh, he must be calling out to someone else." I told my boss I'd call back. "I need to put my watch on," the blind man pleaded. "No problem," I replied. He reached out his hand and handed me a watch. He kept that same hand outstretched so I took the watch and strapped it to his left arm. "My name is Richard," he said. "What's yours?" "Joe," I said. "Joe Watch-Putter-On-Guy," I said, to cover my embarrassment. "Thank you, Joe" he said. When I got a block away I turned around to look back and the blind man was no longer in sight. The mosque and firehouse were both closed tight at this hour. Where could he have gone? Maybe he reversed direction back to Seton Place and then tapped on the 70 Precinct? Then I wondered, why would a blind man want a wrist watch? It didn't appear to be any different from the watch I was wearing. Maybe it had a special audio component to announce the time? Or maybe the glass cover flipped open so he could feel the hour and second hands? Or was this a strange portent? Or maybe it didn't happen and I was just sleep-deprived? Is it later than we think? Does time wait for no none? Or maybe as the Chambers Brothers used to sing, "Time Has Come Today"?